Smithsonian Channel app Wins Webby Award! 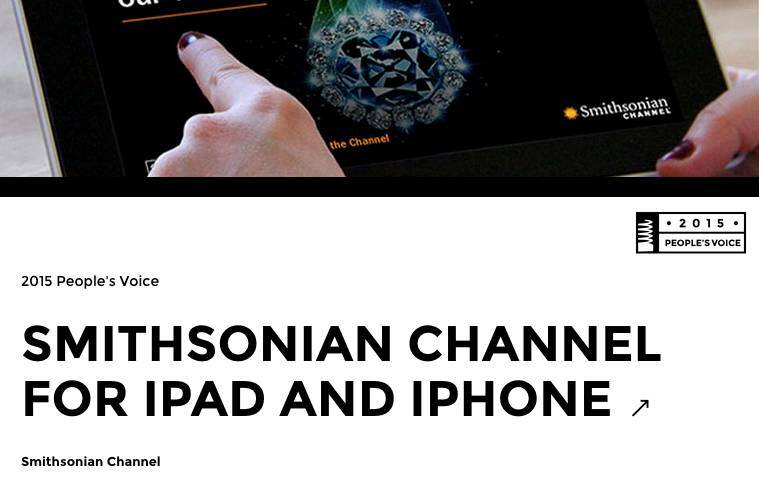 The Smithsonian Channel app that we’ve built on iPhone and helped to enhance on iPad has won a 2015 Webby Award for People’s Voice in the Education & Reference category. Congratulations to Potion Design and Smithsonian Channel for this prestigious honor! This entry was posted	on Tuesday, April 28th, 2015 at 9:12 pm	and is filed under Uncategorized. You can follow any responses to this entry through the RSS 2.0 feed. You can leave a response, or trackback from your own site.